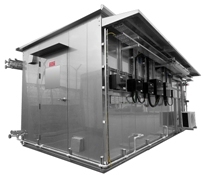 A variety of pre-fabricated analyzer houses are mainly made of stainless steel (SS304 and SS316 grade plate) with insulation, electro-galvanized sheet steel (painted to specific painting specifications) with insulation or glass reinforced polyester (GRP) with insulation. The analyzer house with specific requirements is also available. The dimensions of analyzer house vary from 2.0L x 2.0W x 2.5H (m) up to 12.0L x 3.5W x 3.0H (m) subject to the quantities of process analyzers to be pre-installed.